For all of Duterte’s rhetoric, substantive defense cooperation continues to be advanced, including on terrorism. On June 5, the United States delivered new military equipment to the Philippines to assist Manila in its fight against terrorism. The move is yet another sign of the continuing opportunities that exist for bilateral cooperation despite the challenges the alliance has faced under Philippine President Rodrigo Duterte thus far. U.S.-Philippine security cooperation has been ongoing for decades. Despite controversy, varying levels of U.S. military presence – which dates back to 1898 when Washington first colonized the Philippines and continued on even after the country gained independence in 1946 – helped the Philippine government confront various internal challenges, ranging from communism to terrorism, while also deterring external threats from the Soviet Union and then a rising China. But the environment for bilateral collaboration has been complicated since Duterte assumed the presidency last June. Duterte has vowed to pursue a more independent foreign policy that diversifies Philippine alignments away from its traditional ally the United States and toward other major powers like China and Russia (See: “The Limits of Duterte’s US-China Rebalance”). He has also publicly criticized the U.S. military role in the Philippines and downgraded some U.S.-Philippine security cooperation (albeit not as sharply as his rhetoric initially suggested) (See: “Where Are US-Philippine Defense Ties Under Duterte?”). Yet as I have repeatedly noted, the prospects for U.S.-Philippine defense ties are in fact brighter than Duterte’s personal sentiment might suggest, in part because his statements belie the deep institutional bonds between the U.S. and Philippine militaries and publics as well as the convergence of interests between the two nations in the face of common challenges (See: “The US-Philippine Alliance Under Duterte: A Path to Recalibration”). Chief among these is terrorism, as has been demonstrated by the Armed Forces of the Philippines’ (AFP’s) struggle against Islamist militants in the city of Marawi on the conflict-ridden southern island of Mindanao in the past few weeks. The United States and the Philippines have a long history of cooperation when it comes to terrorism, which became a focus especially after the September 11 attacks. The most often cited manifestation of this was the Joint Special Operations Task Force-Philippines (JSOTF-P) – which started in 2002 and saw up to 600 official U.S. military personnel in the country. Though JSOTF-P was deactivated back in 2015, some personnel continue to remain to advise and assist Philippine security forces. Washington also continues to provide various forms of aid to the Philippines today. 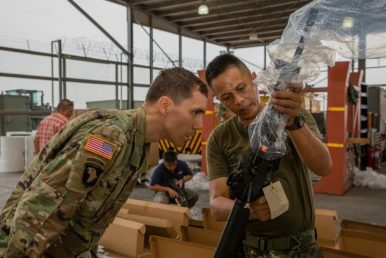 On Monday, in an illustration of this continued U.S.-Philippine security collaboration, the United States provided another round of military equipment to the Philippine military. Officials from the Joint United States Military Assistance Group (JUSMAG), which has been in the Philippines since its establishment in 1947, turned over equipment delivered recently under Washington’s Counterterrorism Train and Equip Program at a transfer ceremony at the Philippine Marine Corps (PMC) headquarters in Taguig. According to the U.S. Embassy in Manila, 300 M4 carbines, 200 Glock 21 pistols, 4 M134D Gatling-style machine guns, and 100 M203 grenade launchers were delivered May 18-22 to Clark Air Base, while 25 new Combat Rubber Raiding Craft (CRRC) with outboard motors were delivered on May 30 to PMC Headquarters. The deliveries were just the latest in a series that have continued even after Duterte took office. In January, JUSMAG representatives delivered new military equipment to the Philippine Army and Marine Corps, including over 400 M203 grenade launchers, 85 M40A5 sniper rifles, and a RQ-11B Raven unmanned aerial vehicle system consisting of three drones for exclusive use and ownership by the Armed Forces of the Philippines. And in October last year, JUSMAG delivered pallets of new military equipment to the Philippine Marine Special Operations Group, Philippine National Police-Special Action Force, and Philippine Coast Guard that included tactical Harris radios, ballistic helmets, and diving gear. According to the U.S. Embassy in Manila, over the past decade alone, JUSMAG has delivered and programmed 7.3 billion Philippine pesos ($147 million) of military equipment to the AFP to enhance counterterrorism capabilities. This is apart from other assistance that the AFP receives through U.S. programs such as Foreign Military Sales (FMS) and other grants from U.S. agencies. The embassy calculates that in just the last five years, the U.S. government has allocated 15 billion pesos ($300 million) of grant funding to provide the AFP with equipment, including corresponding upgrades and training. Apart from the recent collaboration, it is worth noting that JUSMAG’s history is itself a powerful reminder of the history of U.S.-Philippine defense cooperation. Since its founding in 1947, JUSMAG Philippines has provided aid and assistance to the AFP in various areas including training, equipment, and organization. This year marks its 70th anniversary, and in March the U.S. Embassy inaugurated the Major General Albert M. Jones Memorial Award, which recognizes the first JUSMAG chief, who had survived the infamous Bataan Death March during the Japanese occupation of the Philippines during World War II. The award was presented to Philippine Defense Secretary Delfin Lorenzana, who in receiving the award also stressed the importance of U.S. counterterrorism assistance. What Will the 2018 US-Philippines Balikatan Military Exercise Look Like? The evolution of the interaction bears watching within the context of the broader defense relationship in the Duterte era. Why the Philippines' New US Drones MatterWhat's Behind the New US-Philippines Drone Hype Under Duterte?US Gives Philippines 2 New Military Surveillance Aircraft Amid Rising Terror ThreatPhilippines, Czech Republic Ink New Defense PactWhat’s in the New Jordan-Philippines Military Pact?